Yay! Thanks for this! I've been waiting for 6 months to trim my hair, and now it's about to go down! 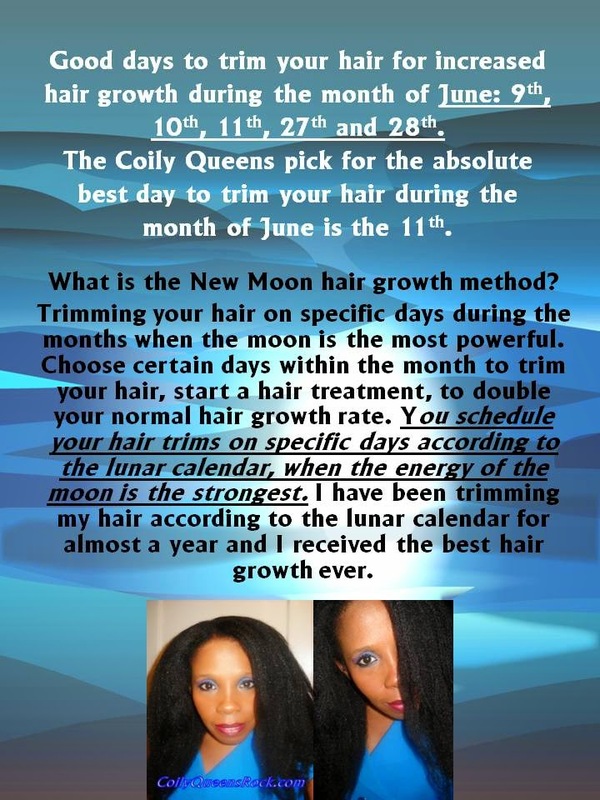 By the way, you should totaly do a before and after on your one year anniversary from your new moon growth. Good ideal let me see what photos I can collect. I trim 3 times a year. I started doing the New Moon trims in August of last year. Thanks for the ideal!!! Thank you for visiting the site! Thanks a lot!!! okay, so i just got my hair trim and i was mortified to see it was an hair cut instead. (tears, i'll get over it.... just bare with me right now) ... my main concern is not how to retain hair super fast, but how to.... perhaps preserve what i have while growing it in. I was really excited to find that my hair grew to my armpit (lady says it was past my bra strap, but... i'll claim armpit, just because i could clearly see it in the front) and all for it to go down the drain because of scraggly ends that were making my life a misery.... how do i protect my ends!!! Any dates for July 2014 yet? I would like to plan ahead. I was thinking to trim them on June 28th and once again dust my ends on July 11th but every site has different information. If it helps I live in North Carolina and I have really thin hair. Thanks for this blog, it has helped TREMENDOUSLY! have you tried the farmer's almanac site? It was very similar to what Ms. Vee posted. Im in NC too!! I have thin hair but it looks THICK. What part of NC are you in? I just wanted to let you know that I am featuring you on my blog because you have done such a great job with designing your blog and increasing your followers. I am hoping to hear what you think I should do to improve my blog or to get noticed. Hello and thank your for reading my blog. Thank you for the nice compliment I will check your blog out. Blessings!! !